Pictured above is Ace from DarkDynastyK9s, arguably one of the most muscular dogs in the world. Ace’s most predominant muscles are his triceps, Bicep Femoris, Scapular Deltoid, Acromion Deltoid, and his lower Trapezius. 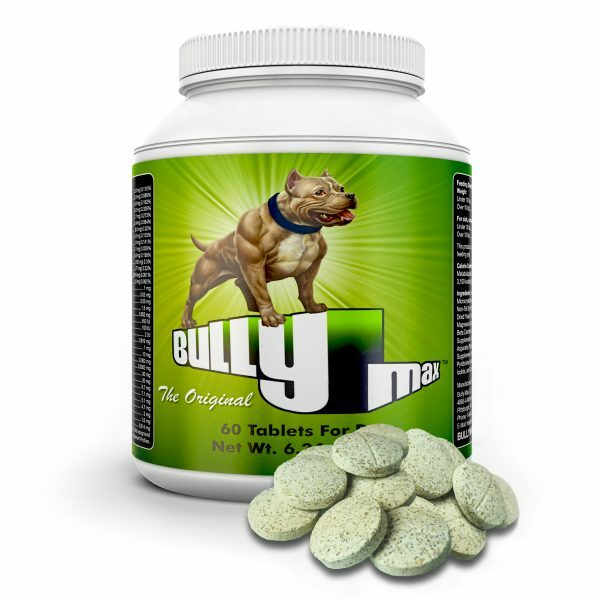 Ace uses Bully Max™ along with a 30/20 (30% Protein, 20% Fat) kibble. 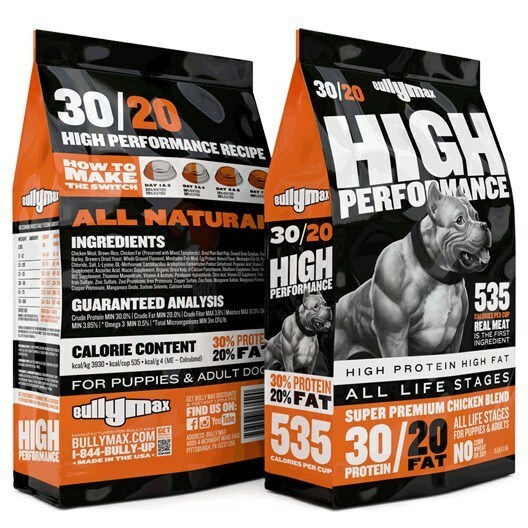 It’s the ideal diet to excel dog muscle growth. Any dog owner that has run playfully through the backyard or a local park with their beloved pet has no doubt marveled at the speed and graceful maneuverability a dog possesses. Like other mammals on planet Earth, dogs have a complex skeletal and muscular system designed to support both voluntary and involuntary movements. However, since dogs do not share the same body type as a human, that means it has a different musculoskeletal system than humans. The muscular anatomy of a dog, while serving the same purpose in a dog, differs in structure and function from the muscular system in a human body. Just as the human muscular system is composed of units of tissue connected to the skeletal system, skin, and other muscles, a dog’s muscle anatomy is arranged in a similar fashion. Additionally, both muscular systems use the power of contraction to produce movement. From here, it becomes too difficult to compare the muscle anatomy of dogs and humans. 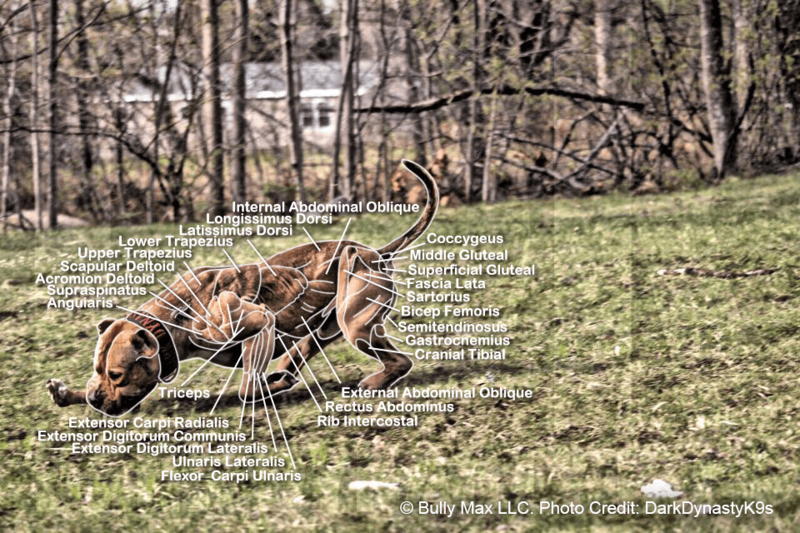 The muscle anatomy of a dog serves two important purposes. The first, and most obvious, is to facilitate movement of the limbs, head, neck, and joints. An equally important function for muscles is to provide stability to the joints of the body, making it easier for them to function under pressure. 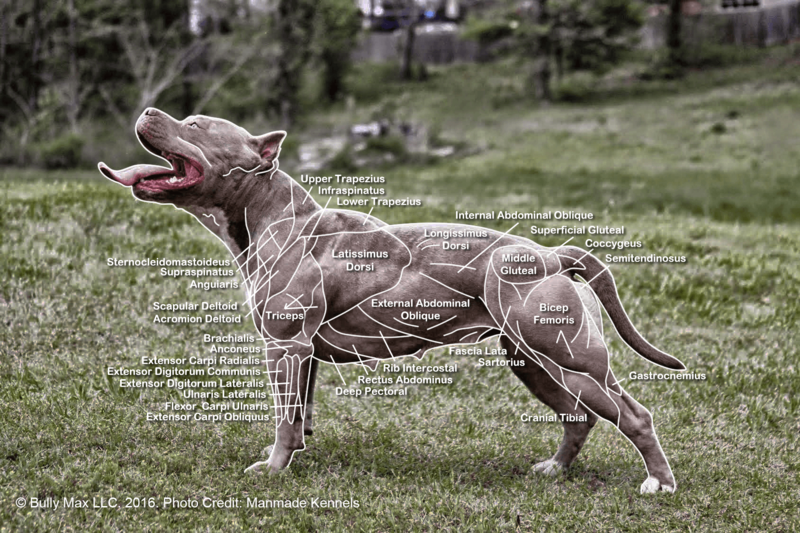 Pictured above shows the dog muscle anatomy of the canine. This particular dog uses Bully Max™ supplements along with moderate exercise to achieve this amazing physique. The muscles found in the body of every dog are composed of a mass of cells held together by connective tissues. Connected to the skeletal system, skin, and other muscles, each muscle in the body helps to create movement. Muscle fibers in a dog’s body receive electrical impulses from the brain via the central nervous system. These impulses are converted into a form of mechanical energy in muscles that forces it to contract, thereby producing movement. Connective tissue that hold muscles together in a dog’s body can differ based upon the type of tissue they form a connection with. Skeletal muscles, also known as striated muscles, are those which connect directly to bones in the skeletal system. Tendons, which are elastic and strong tissue fibers, form the connection between skeletal muscles and bones. As these muscles contract, the tendons are pulled on, and in turn pull on the bones to create movement in the limbs. The other muscle groups of the body are built-in, for a lack of better terminology, to the internal organs of the body such as the heart, diaphragm, and intestines. These muscles flex as part of the operation of these various organs and are under the involuntary control in the brain. Just as in the human body, the muscle anatomy of a dog consists of both voluntary and involuntary control. Voluntary muscles are those within the body of dog which can be directly controlled by conscious thought. The decision to chase a ball across the yard involves a conscious choice by a dog. In deciding to run after a ball, the dog’s brain sends electrical impulses through the nervous system to muscles such as the infraspinatus, pectoral, trapezius, biceps brachii, and gluteal muscle to facilitate movement. These impulses force the contraction of those muscles groups and engage the shoulders, adduct and abduct of the legs, and control the hip as a dog runs. The other half of the puzzle consists of involuntary muscles in the body. Involuntary muscles are not controlled by conscious thought, but rather are controlled and managed by the brain using the autonomic nervous system. The brain automatically regulates the functions of these muscles to keep a dog alive. Involuntary muscles include the heart, diaphragm, and intestines. The muscle anatomy of a dog consists of three main types of muscle tissue: smooth muscle, skeletal muscle, and cardiac muscle. Each of these types of tissue serves a different purpose in the body of a dog and is under the control of either the voluntary or involuntary system. Smooth muscles consist of those tissue types which are found within the walls of hollow internal organs. Examples of this type of tissue in the body include the heart, stomach, and blood vessels. Each of these smooth muscle tissues are under the involuntary control of the autonomic nervous system. Skeletal muscles, as mentioned earlier, are those which are connected to the skeletal system of a dog’s body. Consisting of muscle tissues and tendons, these muscles are controlled voluntarily by a dog and are used primarily to facilitate movement. Examples of skeletal muscles include those which control walking, eating, eye movement, and tail wagging. Finally, there are the cardiac muscles of the body. This specific muscle group consists of those muscle fibers which surround the heart and power its functioning. Cardiac might be the most unique muscles in a dog’s body as they are striated muscles like skeletal muscles, but cannot be controlled voluntarily. Generally speaking, the muscle anatomy of a dog can be easily broken down into two distinct regions of the body. The Thoracic Limb of the dog consists of those muscles in the upper trunk of a dog’s body, while the Pelvic Limb consists of the muscles found around the hip joints of a dog’s “lower” body region. There are seven major muscles found in the Thoracic Limb of the body and they include the supraspinatus, infraspinatus, pectoral, trapezius, biceps brachii, brachialis, and triceps brachii muscles. The supraspinatus and infraspinatus muscles are responsible for controlling the shoulder and supporting the shoulder joint. The former allows a dog to extend the shoulder during movement, while the latter flexes the shoulder joint. Pectoral and trapezius muscles in a dog control the flex and movement of the legs. While the pectoral muscle allow for the adduction movement of legs (or medial movement), the trapezius muscle abducts the leg allowing for lateral movement while also allowing dogs to elevate their legs. The biceps brachii, brachialis, and triceps brachii control the flex and movement of elbows and assist in the extension of shoulders. When it comes to the Pelvic Limb region of the body, there are another seven muscles/muscle groups that help control and support the movement of hip muscles and joints. These muscles include the gluteal muscle, biceps femoris, semitendinosus, semimembranosus, quadriceps femoris, cranial tibial muscles, and Achilles tendon. Gluteal muscles help a dog extend and abduct the hip joint. The biceps femoris, semitendinosus, and semimembranosus all help support the extension and flexing of the hip, stifle, and tarsus features of the body. The quadriceps femoris is a powerful muscle that acts as an extensor for the stifle while also flexing the hip. The cranial tibial muscles and Achilles tendon both help dogs flex the tarsus, extend digits, and also flex the stifle. All of these muscles within a dog’s body have to work together in a delicate balance to help create stable, fluid movement. 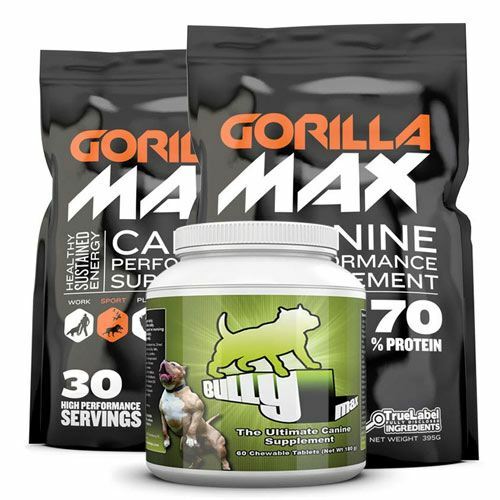 When your dog is bounding across an open field or yard in pursuit of a tennis ball or chew toy, that function is never as simple as one muscle, or even one muscle group, contracting and flexing to make movement possible. The various muscle groups and types within the body of a dog all work together to keep a dog’s body functioning, moving, and flexing. Each muscle group serves a vital purpose, and in many cases cannot act alone to facilitate movement. For example, the skeletal muscles of the body facilitate the movement of limbs while many smooth muscles in the body support bladder continence and propel food through the intestines. During the course of movement, various voluntary muscles must work in concert with each other to support stable movement. Voluntary muscles are capable of contracting and pulling, but cannot push. As a result, they work in tandem with other muscles that control flex and extension functions. Extensor and flexor muscles are a perfect example of muscle groups that work together to facilitate movement. Flexor muscles bend the joints and help dogs pick up a limb, and the extensor muscle then contracts the muscle to bring a limb down. A final example of the delicate balance and teamwork of muscle groups can be found in the adductor and abductor muscles of the body. The contraction of abductor muscles move limbs away from the midline of the body, while the contraction of adductor muscles move limbs back toward the body’s midline. Of course, all of these muscles are useless without an adequate blood supply linked into the anatomy the muscle system in order to power contraction of tissues. Arteries supply blood directly into muscles, and capillaries distributes oxygen throughout muscles to support contraction. The intake of oxygen through blood vessels makes it possible for muscles to sustain the movements that are ordered by electrical impulses. When muscles are contracted during physical activity, blood is circulated throughout the muscles after being forced into veins which help distribute nutrients during physical exertion. This is just further evidence of the delicate network of connected systems in the muscle anatomy of a dog that make’s movement and critical life functions possible. Each feature of the musculoskeletal system has a role to play. Whether it is controlling vital life functions through involuntary contraction, or making physical exercise possible with voluntary muscle contractions, the muscle’s in a dog’s body work as one unified system to produce movement and support stability. Dog Anatomy graphic created by Matt Beswick for Pet365. The Cardiac muscle in dogs is just what it sounds like. This is heart muscle which has well-developed cross-striations throughout the muscle. Heart muscle beats rhythmically on its own due to Pacemaker Cells in the Myocardium which discharge and cause the involuntary heartbeat as these fall under the category of involuntary muscles. The Myocardium is just the thickest middle layer of the heart wall and Pacemaker Cells are just cells that set and keep a pace within the heart synchronised properly. Made up of individual muscle fibers, taken together, form the muscle structure. Each muscle fiber runs in a parallel line between the tendons, and most muscle fibers both begin and end at the tendons. The way that these muscle fibers are arranged makes the contractile force additive, that is, when contraction occurs, the force along the line of muscle adds up as more force occurs. Tropomyosin- Tropomyosin is further made up of three subunits. Skeletal muscle is made up of thin filaments and thick filaments. The contraction of muscle occurs when the thin filaments slide past the thick filaments. The so called “power stroke” occurs by what I would call a lever action. A lever from the thin filament detaches from the thick filament, moves down the thick strand, re-attaches, then flexes and pulls the strand shorter. The distance moved is just a few nanometers, but when hundreds or thousands of these lever actions occur all along the muscle filaments, considerable shortening of the muscle occurs. Type I – Red muscle is mostly made up of Type I fibers and is darker, respond slowly and have long latency, and are responsible for maintaining posture. These are long, slow contractions. Type II fibers – White muscles contain mostly Type II fibers and are responsible for fine and skilled movements. They have short twitch durations. The different fiber types are found in different types of muscle. One last titbit about muscle is that dog skeletal muscle has the ability to exert 3 to 4 kilograms of tension per square centimeter of cross-sectional area. This is also true for human skeletal muscle.